First I must apologize not being able to make our final appointment last week. My last maternal uncle died and there was a lot of family business to which I had to attend before the wake & funeral on Saturday. I would however very much like to know the final results of the study and what were the contents of the various formulae and their relative effectiveness. I also would be interested in receiving information regarding purchasing products…particularly if there are discounts involved. Other than that, I am overjoyed to announce that hair is actually growing on the ol’ 88-Ball that is my cranium! My girlfriend definitely noticed, as she would always pat & stroke the bald spot and make some stupid comment just to annoy me. Now she strokes the “now not- so-bald spot” and exclaims how silky it feels…feels good to me too! When I read on the Hair Side about a new hair study by Dr. Klein I thought I should try it, but I was very skeptical. For some reason, I did not believe it will work. I tried some products in the past, but they did not work for me. I made an appointment, but I almost cancelled it the last minute, because I thought it was a waist of time. More or less, I did not expect anything, but because it was free I decided to go ahead and try it. Dr. Klein was very friendly, and he explained to me the purpose of this study. After he collected some information from me he gave me one of the 3 samples (sample A, a spraying bottle with lotion inside). I was instructed to apply the lotion on the bald spots 3 times a day. I started using the product the next day. The application was very easy to use. I had to put small amount on my finger, and rub it on the bald areas of the scalp until it dissolved. The only problem I noticed with the application was that after a few days I could not spray it anymore, because it got stuck. I thought the problem was because the creamy product was a little bit thick, and it could not be sprayed easily. It would be much easier if it was put in a jar instead of a spray bottle. Now, to be able to apply the product I have to use a Q-tip. I did not notice any side effects from the application of the product. The end result after 6 months is that I have new hair on my head. The whole balding area is not covered with hair yet, but I hope the growth will continue, so it covers the whole area. One day I was browsing on internet and I read about Re-Mox. I asked if it would be better than Rogaine and he told me yes it is stronger. I received the first bottle on January 9th of 2006 and the same day I started using it. At the beginning it was a little irritating, but I quickly got use to it. After 3-4 weeks I saw some improvement. But then after 6 weeks I looked at the mirror I saw that it really is different than before. I took another picture after 8 weeks and it was more improved than 6 weeks. It helped me grow hair in the frontal and crown area. I am very pleased with the results. I am not considering hair transplantation anymore. I tried so many drugs and visited so many doctors nothing helped. I have been using Propecia for years, and thanks to that I am not losing any more hair. However, Propecia didn't grow new hairs but my weak hairs became back to normal. I used Rogaine it helped grow some hair but I had puffy eyes, facial and body hair, rough skin and it made me look 5-6 years older than my age. Then I stopped Rogaine. I didn't want to use Minoxidil anymore but hairsite told me to use from a different company it might a different. With Re-Mox III 5% I am very happy. It made me look younger than before. I was lost and now I have confidence. I still have a spot in the crown area but I hope that I will grow enough hair to cover that spot. I am very excited what will happen after 3-6 months. I want to thank Dr. Klein for that Product. I am writing to share with you my great happiness as the result of using your product, REMOX. Your product has saved my self-esteem. I am 43 years old, and my hair has been thinning slowly but steadily for over 15 years. During this time, I have done what many women do, add blonde color to hide the thinness and stop looking in the mirror. I was very vigilant about standing under spotlights, or in direct sunlight (that not just for thinness, but scalp burning). I never talked about it because then it would draw attention to it and I didn't want people to notice it any more than they already did. I really did suffer in silence. Eventually I wore my hair up more and more and sort of stopped looking at it in the mirror. One day, following someone telling me about hair transplantation I went for a consultation. There they took pictures and I was able to see just how bad my thinning was and I was horrified. It is amazing what you don't see when you don't look. Anyway, they told me that I wasn't a good candidate for hair transplantation because the sides of the head where they would harvest the hair from was too thin (unusual for a woman, I had male pattern baldness) and they couldn¹t harvest enough hair to fill all the thinness on my head. I left there devastated and incredibly depressed and resigned myself to the idea of Rogaine, which I had bought, but was a dreadful product. I was visiting a relative in NY who had a friend who had used your product and recommended you to me. The rest as they say is "history". I started using your product REMOX on October 1, 2003 and started seeing growth within a month. Now I realize that many do not see results that fast, and in fact you had supported me in being patient as it can take some time for the product to show signs of working. As you see by the photographs that I have sent you, my hair has grown in so much I find it absolutely unbelievable. I have a full head of hair after only 10 months. My hair is healthy and thick. The very front of my scalp is still filling in and I expect that by years end I might likely be going on a maintenance regime. I know that if I were some random person reading this letter to you I would think this a hoax, but all I can say is that this product really works, and as I said earlier, you have saved my self-esteem. Dr. Klein, thank you so much for this product. Please keep making it, and put it in BIG bottles. And when your ready for a business partner in DC, I here and ready to GO! I looked around for topical products and tried one that did not work so I became very skeptical. I read up on some ingredients being used hair regrowth products and found there had been success with minoxidill and tretinoin. That lead to Remox1 and 2 along with some Saw Palmetto. After using the products for 6 months I could see the progress, my hair stopped thinning and started to grow back. Progress is gradual but the product does work. My barber use to have a hard time with the hair line in the front because part of the right side was eatten away but now its easy. I still have a little progress to make and I know I'm using something that works. Thank you Dr. Klein. I read your web page and tried the Remox II lotion. In six weeks I notice it staring to work. In about three months my hair line started to be working its way back. I can testify that your products works. It has brought my hair in the front back. THANKS !!!!!!! Please feel free to use this email or anything else that I can do as a testimonial for your product. It worked for me. I would just like to say Thank You for developing such a wonderful product. I have been using RE-MOX for about 3 years now and I have noticed that my hair loss has completely stopped and that my thinning spots have been gradually filling back in. I am a 32 year old male and I have been losing my hair for the past 13 years or so. I have tried all the products on the market including Rogaine and none of them seemed to work for me. I started using your product after I had heard about how a combination of Minoxidil and Tretinoin can provide a potent one two punch in knocking out Male pattern baldness. I wish that I would of started using your products earlier, so that I wouldn't have so much hair to fill back in, but I feel eventually it all will with RE-MOX. I, along with thousands of others have been a victim of bad hair transplantations, in which have left my head scarred and my social night life destroyed. To improve my appearance, I tried using propecia but it didn't work for me.I tried also using rogaine but it only caused my head to irritate so much that I couldn't stop itching it. That's until I discovered your product. In the first few months, I wasn't seeing any results and I was starting to get depressed thinking that your product wasn't going to work. That's until my barber started to notice that I was growing hair. Soon afterwards, my friends and family started to notice also. So far it's been 8 months that I've been on Remox 1 & 2 and I'm continuing to see great results. And just a month ago, It was the first time in 8 years, where I stopped wearing a hat whenever I ventured outside away from home. Could you believe that? 8 years!!! 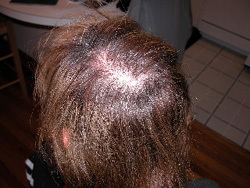 Keep up the good work and hopefully one day you will discover the magic bullet to end all hair loss. Good Luck and I thank you for what you've done for me and thousands of others. I am now in my sixth month of using Re-mox, both one and two, and continue to see impressive results and new hair growth. This week alone my boss, a co-worker, and my brother-in-law all made comments about my hair growth. All of these comments were unsolicited and quite frankly I thought at first that my brother-in-law was teasing me since we have both been losing our hair for many years. But the proof of the pudding is in the eating, as some would say, and there's no denying that I'm growing hair in places where it hasn't been in years, front and back. I would encourage those who are looking for answers to their hair loss problems to try your treatment for at least eight months since the most difficult time for those who start a hairloss program is the first six months of treatment. This is a gradual processs and many times many cannot see any any discernable improvement in their hair loss for the first few months. I can't tell you how many times I wanted to quit, thinking I wasn't getting anywhere the first few months, but in this endeavor 'Patience truly is a virtue'. As an adjunct to the Re-mox program I have also been using Propecia and vitamins with Saw Palmetto as an anti-androgen, so I would encourage those to also consider using all these things collectively to attack the problem of hair loss. Once again, I would like to thank you for all your help and will continue to watch as the miracle unfolds before my eyes. I just wanted to send you a note to say how happy I am with your product. I have been on Remox since November 1999 along with a daily 1mg dose of Propecia. The results are astounding! Not only do I notice the difference in my hair, co-workers, family members have noticed the difference. This is from someone who had shaved his head for appoximately two years because nothing seemed to work. Thanks once again for your assistance. Please feel free to use this testimonial! "I only started using a combination of Remox and Propecia about 4 months ago, and I already have noticeable hair growth on what had previously been a very bald crown. No mess, no fuss and no side effects whatsoever. Dr. Klein and his staff have always been remarkably accessible and responsive to any questions or requests. I was a firm disbeliever in any of these treatments, but the last 4 months have turned me around 100%. I highly recommend these products." I am a 35 year old male who started losing my hair in my mid twenties. As a result of this I had begun to see the classic horse shoe pattern at the crown of my head and very noticeable receding hairline. I told myself that it didn't matter, started combing my hair to try and cover it and eventually just wore a base ball cap all the time. At the same time I started using minoxidil 2% then switched to 5% when it became available. I even added Propecia to my routine with marginal results. I still had hair falling out in the shower on my pillow and in my comb. Needless to say I was desperate for a solution when I found you on the internet. I called for my free consultation with Dr. Klein I was surprised to find that he and his staff were more helpful than the dermatologists I had seen in my area. I started using Remox in November 1999 and . By the end of the first week I noticed no more hair in the shower drain, in my comb or on my pillow. I now have reduced the balding on my crown significantly. Remox is even putting back the hair line that had been eroding for the past ten years. I am seeing new growth every week on all areas of my scalp! Although I have not compared pictures, I believe that I can objectively say that Remox is working. I am happy with the product and intend to reorder it. I have read about it on the website and the science behind it makes sense to me. 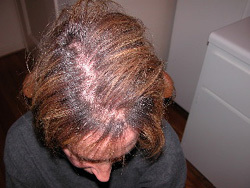 Especially since it seems the problem with Rogaine and the scalp is that Rogaine alone does not have enough absorption. I have found that using Remox about 3 times a day- morning, lunch, before bed, does not cause any flaking or inflammation of the scalp. Thank you"
"I never believed that I could trust anyone on the "web", there are so many shysters out there, especially in the "hair re growth " field. It seems anyone with a couple of bucks and a hustle can create a fancy concoction and sell it on the internet, with all types of hyped up research. Because of this and many years of experience in losing hair, I decided to consider only medically approved formulas. There are only a few real sites out there that are directed by medical doctors and after careful research I found that the most unique, run by Dr. Oscar Klein. This web site is as close to a private medical office as cyberspace will ever allow. Dr Klein is professional, knowledgeable, kind and always available for consultation about any problem. He believes that he has a personal responsibility to each patient and you can hear it in his voice when he speaks with you. He does not accept any patients into his program without a personal consultation, which is unheard of in the hustle and bustle of the internet. 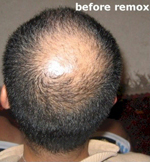 Furthermore, his medication, Re-Mox is fantastic for hair regrowth and maintenance. It is safe, easy to apply and economical (his product is less than 1/2 the price of a similar, much weaker product sold by another doctor on the web). I have been using the product for 6 months and still can't believe the great results I have gotten. I am overjoyed with my new, rapidly growing hair in areas where there was none and on which I had given up hope, after using many worthless "hair growth" formulas, with zero results. Thank heaven, that there are still good, caring physicians out there, even in cyberspace." Your products are fantastic, I am longer worried with hairloss, and I am delighted to know that I will always have a full head of hair throughout my life. It makes me look at least 10 to 12 years younger. I have met a nice Latin American woman here in London. I'm sure she would not have been interested in me if I were bald and suffered with thinning hair. So I thank you for this. The two After pics (I'm wearing a blue shirt) were taken in August , so they represent approximately 1 year on the aforementioned regimen. As you can see, I've experienced great regrowth in the crown area, and more modest regrowth in front. I have no idea how representative these results are, but I'm hopeful that others may experience similar success. continued success with your regimen!